Foreign Affairs Minister Chrystia Freeland wonders if the implications of some details in the latest NAFTA auto proposals had been properly thought through. WASHINGTON — Canada is voicing concerns heard from car companies that some of the rules being considered during the NAFTA negotiations could prove damaging to one of this continent's biggest industries. 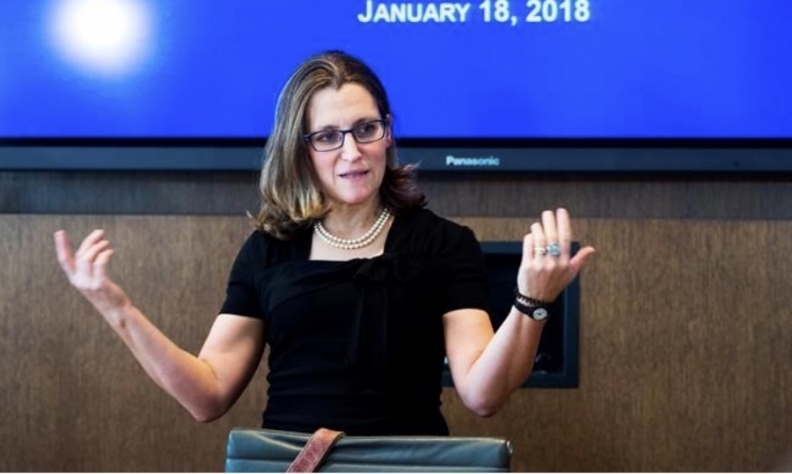 Foreign Affairs Minister Chrystia Freeland says she raised some of those worries Wednesday during a meeting with her U.S. counterpart, as countries make what could be a last stab at a deal in 2018. She also asked questions about whether the implications of some details in the latest proposals had been properly thought through. "[These] are the rules that govern this huge, highly integrated automotive industry in North America. Making a mistake could mean burdening companies with far too much red tape — something that's too cumbersome that makes North America less competitive, compared to the rest of the world," Freeland said upon leaving the meeting. "That's certainly an issue that I'm very, very focused on. I want the rules that we come up with to be rules that do not force our car companies, and our car-parts companies, to be spending too much time on administration and on box-checking, when I would like them to be spending most of their time inventing — and building — really, really great cars and trucks." The latest U.S. proposal demands that 75 per cent of every car use North American parts, that 70 per cent of all steel be North American, that 40 per cent of every car be built by workers making $16 per hour and that companies get credit for research and development spending. One industry-funded study by the Center for Automotive Research says those rules would increase the cost of a car by hundreds or even thousands of dollars, essentially act as a multibillion-dollar tax, and ultimately hurt sales. The study calculates that somewhere between 25 per cent to 87 per cent of vehicles currently sold in the U.S. would fail to meet the new rules, and would wind up simply paying a tariff. While the U.S. goal is to steer manufacturing work back north, the fact that the U.S. tariff for non-compliance is only 2.5 per cent has some industry-watchers saying the new rules would just create more tariffs, not jobs. Mexico in particular has opposed the American proposal, and has countered by recommending more modest changes. Autos are considered a key issue in the talks, which must necessarily be resolved before the countries make the final tradeoffs in other sectors required to achieve a deal. If such an agreement does not happen in the next few weeks, there is a chance the process will go into political hibernation for the duration of the year, as Mexico and the U.S. hold national elections. "NAFTA's important to our industry, so we're extremely hopeful that all three parties will be able to quickly come to some sort of agreement," said Matt Blunt, president of the American Automotive Policy Council and former governor of Missouri. "We've urged a speedy completion of the negotiation, and always felt like the certainty of NAFTA was extremely important." He said he was encouraged that there has been progress in the talks. For months, the U.S. was proposing that half of all car parts be produced inside the United States.